While public opinion polls show a tight 3-way race thanks to a surging NDP, the Conservatives and Liberals are running away with the popularity contest on Facebook, according to Facebook Canada data provided to CTV News. 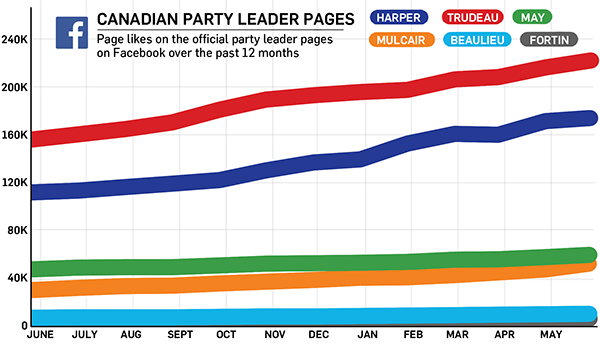 While the Conservative Party of Canada so far has the most Facebook "likes" of any federal political party, Liberal Leader Justin Trudeau is on top when it comes to leaders, according to Facebook analysis over the past 12 months. Note: interactions don’t necessarily denote support -- although "likes" and shares are usually positive, comments can sometimes be critical and negative reactions. The NDP, meanwhile, has failed to win a single riding in Canada when it comes to "likes," and only places as high as second in 12 ridings. While they consistently place third in ridings across the country, the NDP has so far failed to win a plurality anywhere. This would explain their lack of presence on Facebook Canada's Political party Support Map below, which shades ridings based on which political party and leader have the most "likes" originating from people living in those regions. It's interesting to note that while the NDP has yet to come out on top anywhere when it comes to Facebook "likes," the smaller Green Party and the more regional Bloc Québécois and Forces et Démocratie gained a plurality in this category in a handful of ridings. The Liberals earned the most "likes" in the most areas, finishing first in 161 of Canada’s 338 ridings and second in 141. Close behind them are the Conservatives, who took top spot in 136 ridings and were runners-up in 128. And from there, the cliff drops off, with the Bloc Quebecois and Green Party only earning a plurality in six ridings each. 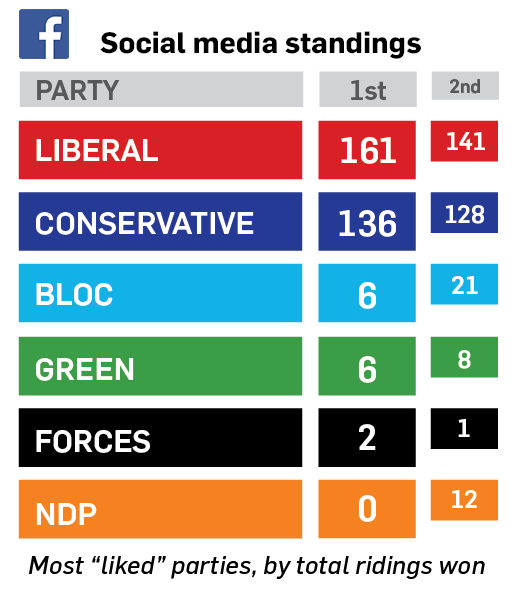 Outside the Green’s small pocket in Vancouver and the Bloc’s support around the Montreal area, Liberal red and Conservative blue drown out the other parties in terms of social media presence. This becomes especially apparent when looking at the NDP’s whopping zero ridings on the map – despite a three-way race in the polls, the NDP trail behind when it comes to Facebook reach. For a party-by-party breakdown, the slideshow below features heat maps showing party support, the darker shaded areas representing regions where they’re getting the most "likes." Facebook created the maps by comparing the number of public "likes" on Facebook for each party and leader. Click on the arrows or use your arrow key to move through the 6-party support maps. 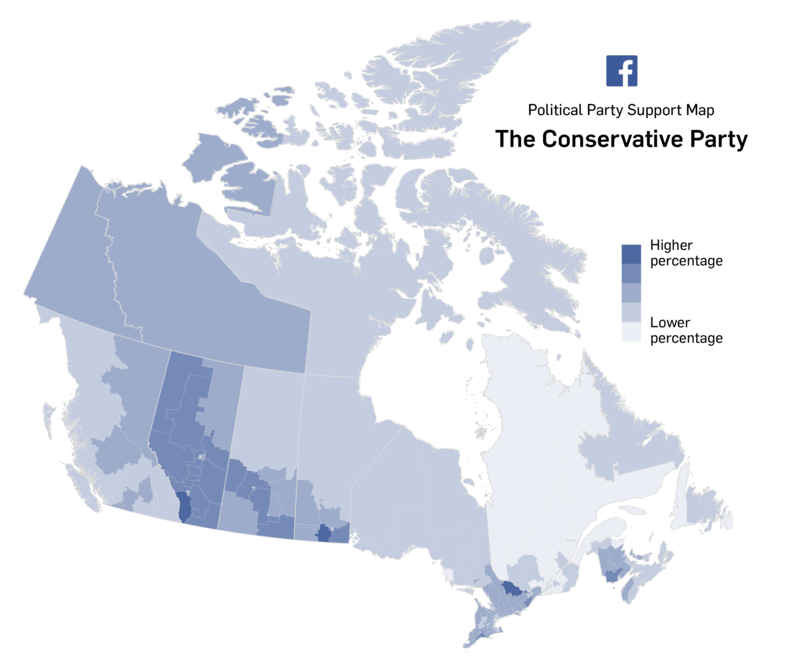 This map displays Facebook political preferences for Canada's Conservative Party. 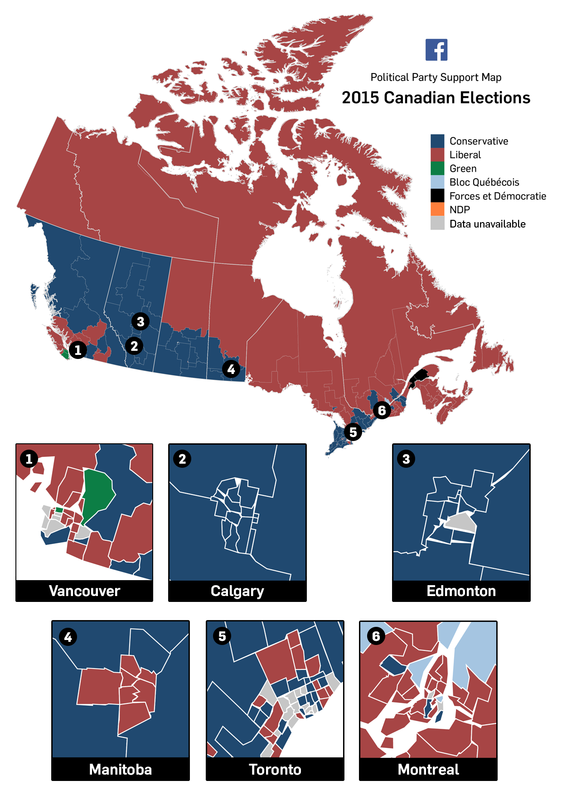 Each federal riding is colour-coded based on the percentage of people in that location that like the official Facebook page of the political party or political leader. 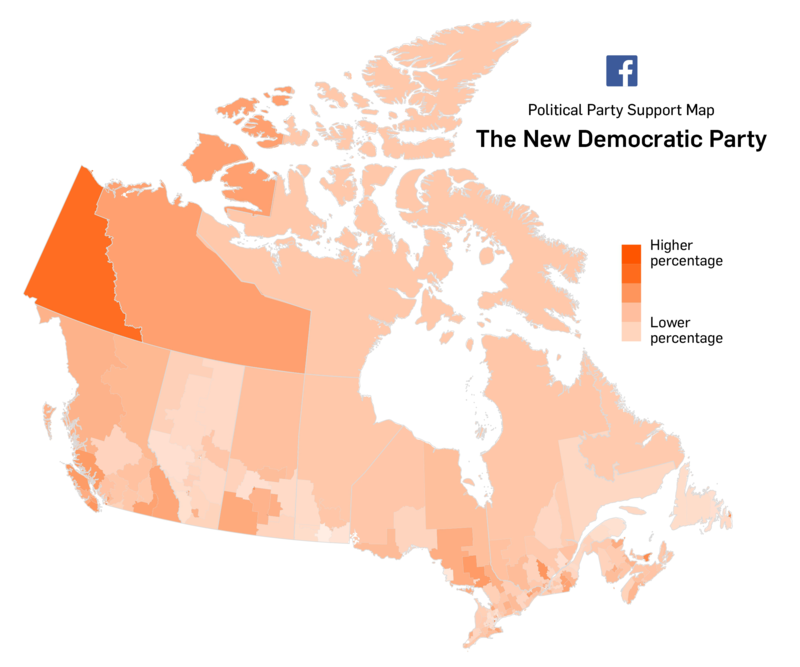 This map displays Facebook political preferences for Canada's New Democratic Party (NDP). Each federal riding is colour-coded based on the percentage of people in that location that like the official Facebook page of the political party or political leader. 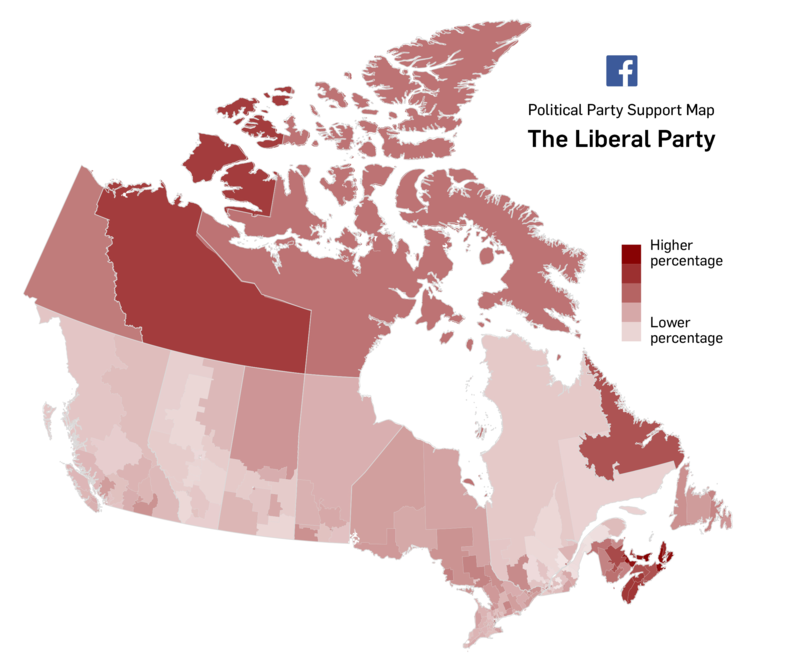 This map displays Facebook political preferences for Canada's Liberal Party. Each federal riding is colour-coded based on the percentage of people in that location that like the official Facebook page of the political party or political leader. 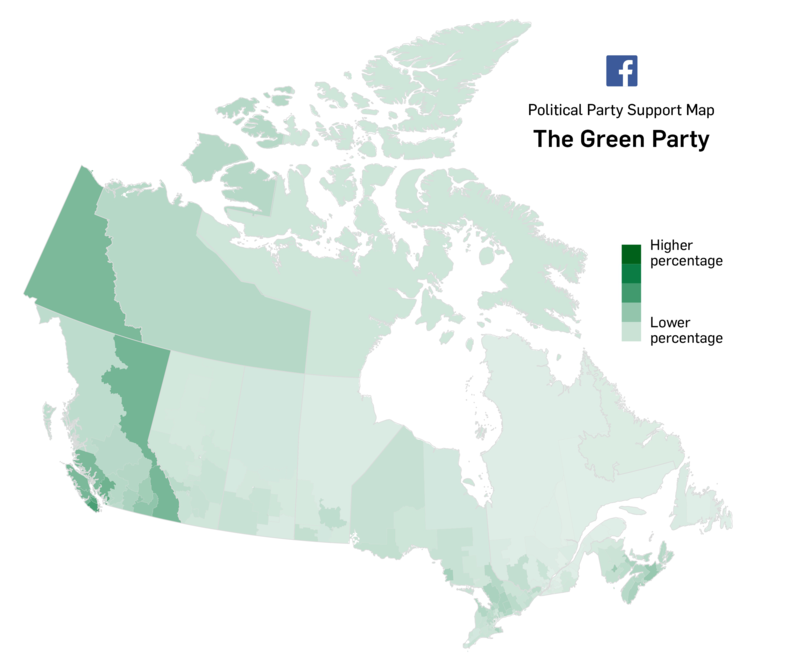 This map displays Facebook political preferences for Canada's Green Party. Each federal riding is colour-coded based on the percentage of people in that location that like the official Facebook page of the political party or political leader. 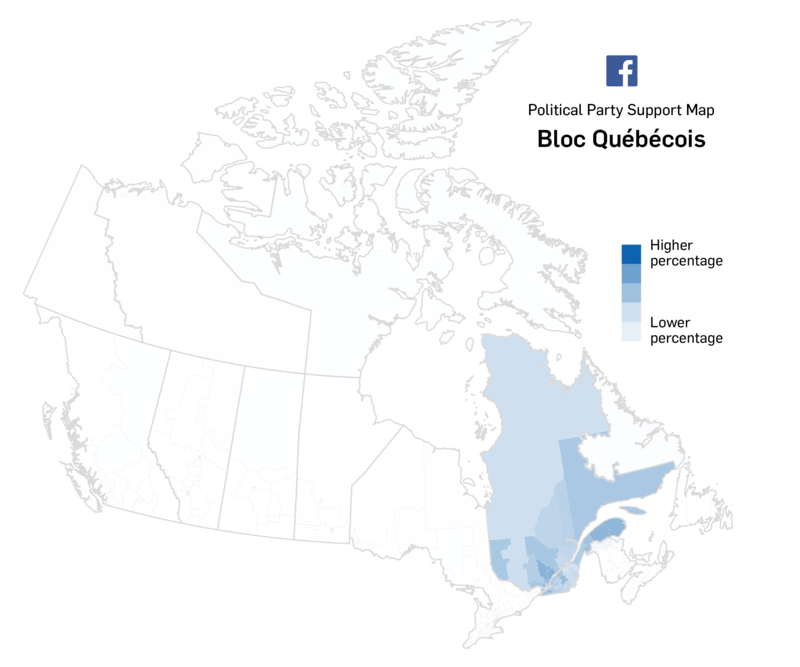 This map displays Facebook political preferences for Canada's Bloc Quebecois. Each federal riding is colour-coded based on the percentage of people in that location that like the official Facebook page of the political party or political leader. 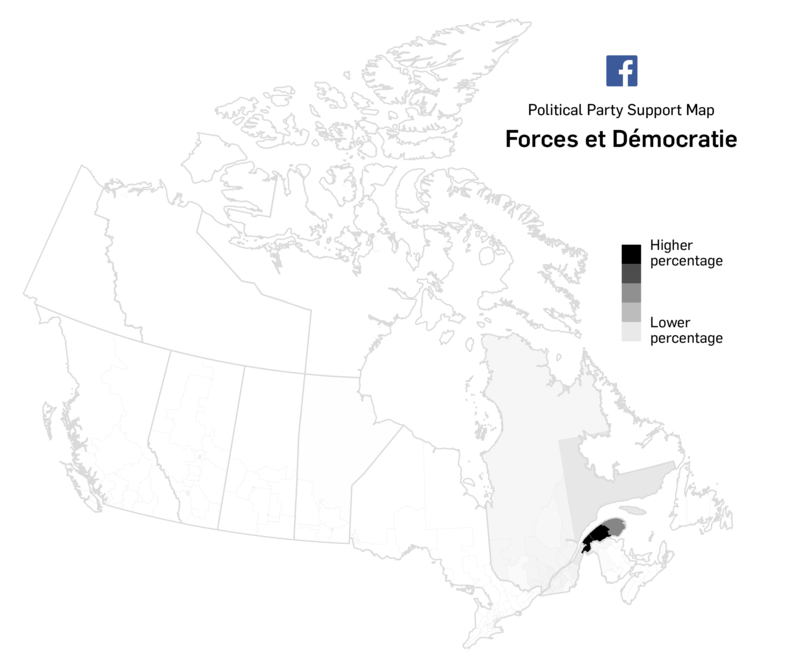 This map displays Facebook political preferences for Canada's Forces et Democratie*. Each federal riding is colour-coded based on the percentage of people in that location that like the official Facebook page of the political party or political leader. *Forces et Democratie is a Quebec-based party created by two Quebec MPs on October 21, 2014. Bloc MP Jean-Francois Fortin and NDP MP Jean-Francois Larose quit on that day to create a new party they say is more focused on serving constituents and the economic health of Quebec's regions, including smaller communities. The following charts show how parties and leaders have performed over the last three months when it comes to engagement with Facebook users. 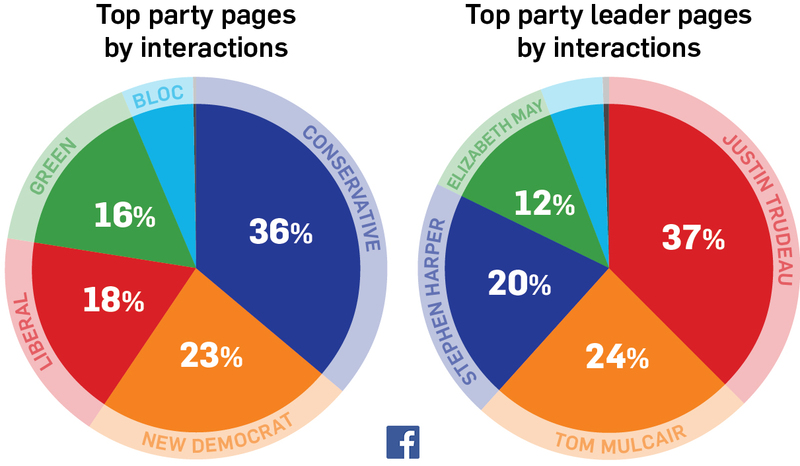 With the most total page "likes" – more than 130,000 – it’s not surprising the Conservatives also have the most total number of interactions by users. 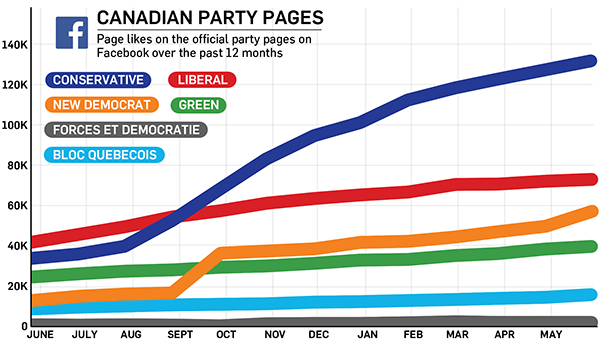 Interestingly, the New Democrats place second in both categories, despite their lower page popularity. This points to a high level of engagement for the users who do follow them on social media. The Bloc Quebecois also only has a small piece of the pie in terms of total interactions – they garnered six per cent of party interactions, with Mario Beaulieu claiming five per cent of leader interactions. But when it comes to an engaged audience, the Bloc come out on top, and according to Facebook the party can boast the most “passionate” followers. One important point to note is that this data was compiled before Beaulieu announced he would be stepping aside to let former Bloc leader Gilles Duceppe retake the reins of the separatist party.